As the economy struggles to regain its footing and competition mounts, an increasing number of companies are taking action by fostering customer-centric cultures that enhance satisfaction and rive bottom-line profitabilaty. A cornerstone of their approach centers around gathering, analyzing, and acting on the voice of the customer (VoC). By carefully crafting VoC programs, and leveraging customer feedback tools to support it, companies are incrasing loyalty, lowering service costs, and boosting profits when and where it matters most. The numbers speak for themselves. According to the Verint-Vovici Voice of the Customer Survey, published in January 2012, more than 40 percent of respondents' companies are using VoC to help improve their customer experiences. And many others are using VoC for everything from increasing customer lifetime value to boosting marketing performance. 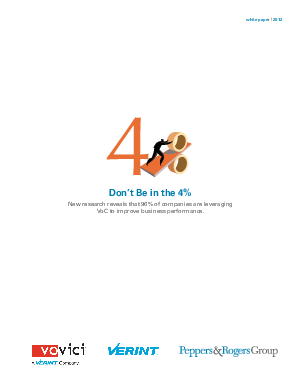 Don't be in the 4%, download this report to learn more.